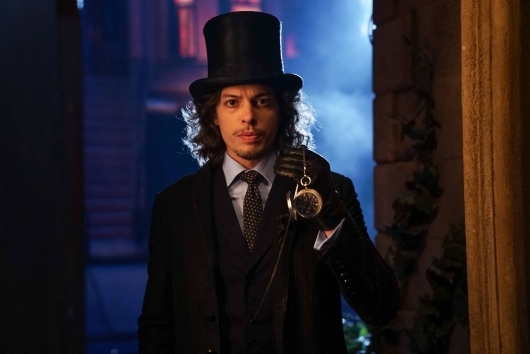 Gotham 3.3 “Mad City: Look Into My Eyes” review: A magician (The Walking Dead‘s Benedict Samuel) performs at Barbara and Tabitha’s (Erin Richards, Jessica Lucas) club. He asks for a volunteer, whom he hypnotizes into balancing on the edge of a chair. Before he wakes him up, he whispers more commands… to let him live in his house. Samuel is a perfect Mad Hatter – so creepy! “I haunt your dreams like a ghost…” He hypnotizes the husband into killing his wife and himself, all for looking for his sister Alice. We see Alice when her landlord comes for his rent money, but willing to take it in trade. She tries to avoid it, but he kisses her and he dies. “514A but they call me 5,” the doppelgänger says. Poor thing! He does not remember before that. Bruce welcomes him to stay. Alfred (Sean Pertwee) is skeptical, with good reason. They argue about him. Has Alfred ever really won an argument with Bruce? Valerie (Jamie Chung) blows Jim off with a “that was fun,” after he tries breakfast and an offer to fix the place up. Underneath it all, Jim is a good guy, despite his questionable line-walking between criminal and law enforcement. 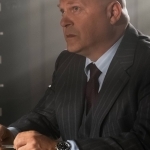 Captain Barnes (Michael Chiklis) tries to get Lee (Morena Baccharin) to come back. I was totally fooled thinking he was talking to Jim. Jim does come strolling in to get his money. Bullock tries to block (such a good friend! ), but Lee sees him. 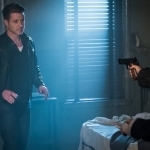 She is moving back to Gotham with her fiance. Jim is sounding more and more growl-y a la Christian Bale’s Batman. 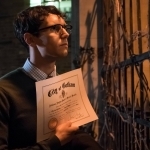 The old Mayor agrees to resume his duties until a new mayor can be elected. Penguin stops the proceedings. 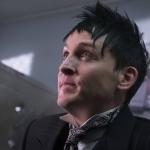 “I, Oswald Cobblepot, announce my candidacy for the office of mayor!” He demands an emergency election “forthwith.” It’s Batman Returns and I love it! Politicians scare Butch (Drew Powell), though. They walk into Penguin’s house and it is campaign central, complete with cutesie posters. 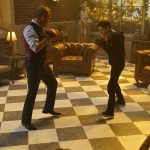 Bruce and Alfred are sparring when fake Bruce comes in. Alfred starts to teach him, and the kid gets a few hits that make Alfred see cartoon birds. Alfred then bloodies his nose and he doesn’t even feel it. What is he? 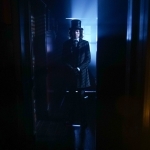 Jervis Tetch aka the Mad Hatter visits Jim, hiring him to find his sister, weirding him out by his talk of Jim’s sadness. Selina (Camren Bicondova) visits to tell Bruce that Ivy’s missing. She’s crying and he holds her hand, while 5 watches. She asks for his help, but he gets rattled and says no. She storms out, while 5 practices imitating Bruce. 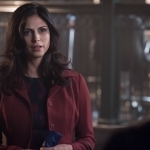 Jim strolls up and asks Selina about Alice, promising to keep an eye out for Ivy. He gets a bat to the head from some goons, also wanting Alice, who seems to be a bit of a firebug. Jim goes to the hospital to get patched up, by none other than Lee’s new fiance. Awkward! And… damn that girl moves fast. I was almost mad at Jim for the Vale fling, but Lee set a record. Jim assures him he wishes them “nothing but the best,” but… “if you ever were to hurt her, I’d have to hunt you down and kill you,” said with a smile. 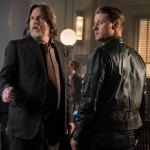 Oh Jim… if you only knew that the fiance’s daddy is the son of Don Falcone (John Doman), who gives Lee a subtle warning about Jim Gordon. I’m sure he will find out in one episode. Jim does manage to find Alice after she shoots the presumed dead, but now crazy maniac guy, and sets the body on fire. As soon as Jim mentions the brother, she runs away. 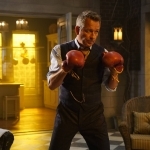 He confronts the Mad Hatter, who hypnotizes him to “sleep forever.” Alice saves Jim. Penguin goes to Arkham. It is literally is a nuthouse. He succeeds in freeing his BFF. Aw!!! 5 picks up Selina after giving himself a haircut and stealing Alfred’s car. She knows something is off, but who would think he would be THAT different? Excellent episode. Is it only the third? Seems poor Jim is ensnared in a quadrangle of him, Lee, Valerie, and always Barbara. I guess we can throw the fiance in the mix too. 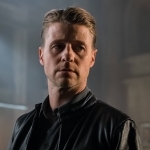 With the mayoral race, Poison Ivy, two Bruces, and Fish lurking in the background, Gotham is filled to bursting with the potential possibilities. This episode felt like it was “5” minutes long. 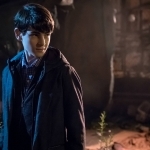 Gotham airs Monday nights at 8pm ET on FOX. 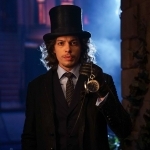 Hypnotist Jervis Tetch/Mad Hatter (Benedict Samuel) arrives in Gotham to search for his sister, Alice (guest star Naian Gonzalez Norvind), and hires Gordon to help find her. 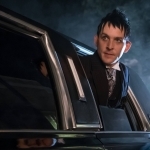 Meanwhile, Penguin decides to run for mayor and Bruce’s doppelgänger begins to channel him, causing some confusion around town in the all-new “Mad City: Look Into My Eyes” episode of GOTHAM airing Monday, Oct. 3 (8:00-9:01 PM ET/PT) on FOX. Alfred and Bruce discover that Bruce’s doppelgänger is stronger than he looks and does not feel pain. Penguin interrupts the former mayor’s speech to ridicule him. Alice’s landlord barges into her room looking for his rent money. Jim finds out that his doctor is Leslie’s fiance, and he issues him a warning.